You remember Alec Baldwin right? He is a Big Mouth liberal actor who outside NBC SNL hasn’t had a decent movie career since 1991. Baldwin and SNL show at NBC are going after President Trump for months! They are using every possible insult to ridicule him. “Libtard” Hollywood actor has made it his mission of late to trash Donald Trump. 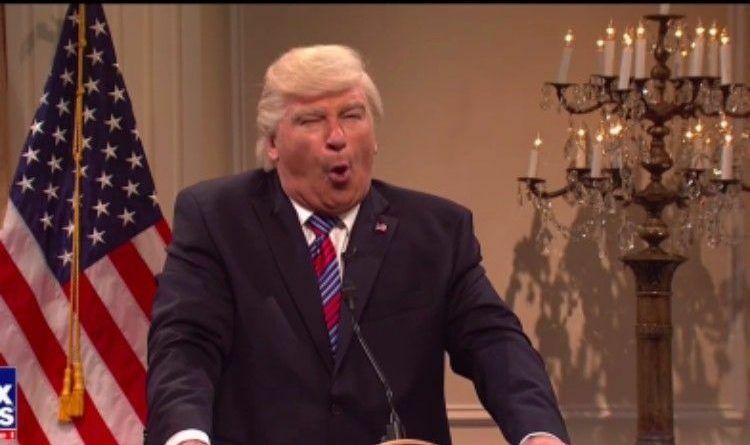 Baldwin has returned to NBC’s “Saturday Night Live” where he reprised his role as President Donald Trump. The cold open seized the opportunity to take digs at the real-life president for his policies regarding immigration, tariffs, Russia and his opinions on the presidency. After the faux press conference, “Trump” agreed to take questions from the press and along with the topic of Stormy Daniels and Amazon, one reporter asked if the president believed his tariffs would ruin the American economy. He added that the presidency was just a “four-year cash grab” and repeated that he doesn’t care about Americans. No one in their right and balanced mind can ever say that President Trump doesn’t care about America! He’s fighting for our country and then loser/has-been so-called ‘entertainers’ – can do nothing but mock him. SNL has gone to the dogs – literally. In reality, Trump is draining the swamp and making America great again. One has to wonder why Baldwin is against that. Let’s look at Obama’s net worth before he became president and his net worth after. President Trump was very wealthy when he took office. Obama, on the other hand, became very wealthy while in office. Talk about a cash grab!